You've come to the right place if you're looking for the best breakfast and brunch recipes for any time of the year. Whether you're looking for a Saturday brunch option or a Sunday brunch buffet, our free eCookbook, Easy-Breezy Brunch: 26 Easy Brunch Recipes for Any Occasion, is sure to fit your needs! Great breakfast recipes come in all shapes and sizes, and we're here to help you achieve that signature “OOH IT'S SO GOOD! !®"
We know that you've been looking forward to the weekend for many reasons. It's a time for relaxation, catching up on errands, and of course, enjoying some tasty food for brunch! Maybe you have your own weekend routine: a favorite diner perhaps or the coffeeshop that's around the corner from your house. Going to a cafe for brunch once a week can get pretty pricy though. Not to mention, why would you want to spend the morning getting ready to go out when you can stay snuggled in your pajamas and cook from the comfort of your own home. Our free eCookbook, Easy-Breezy Brunch, has over 25 easy brunch recipes that you're going to be cooking every weekend. Turn your kitchen into a restaurant with some of the easiest (and cheapest!) breakfast recipes around. Coupled with some soft music and the morning paper, you'll never want to leave home again! Download your free copy of Easy-Breezy Brunch: 26 Easy Brunch Recipes for Any Occasion today. Wouldn't you love to wake up everyday to the smell of crispy bacon and freshly baked eggs? 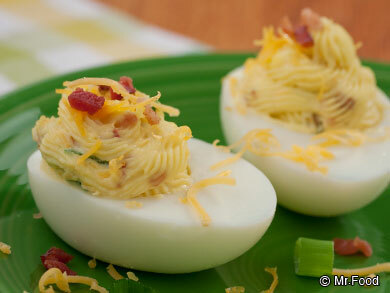 We've got the best of both worlds with our smoky Bacon Lover's Deviled Eggs(page 1). Who doesn't love the crispy crunch of bacon in their breakfast menu? For a bit of an under-the-sea flavor, toss in a helping of Crab Puffs (page 4). Who would've thought that seafood and brunch would be a match made in heaven! For a bit of a refreshing break from the heartier breakfast dishes, our Country Fruit Stand Salad(page 13) ought to hit the spot. Filled with plenty of fresh fruit, you'll think you stepped right into a country marketplace! As a bonus, these easy brunch recipes have small enough portions that it's easy to sample a bit of everything to make the most out of your favorite meals. They're also the ideal easy brunch recipes for guests coming over, so you're always the pitch-perfect host! Welcome one and all to the main event: hearty brunch recipes! We know you've been looking for the best brunch recipes to serve to your loved ones, and we haven't left you disappointed! First, go on a virtual weekend getaway without leaving your neighborhood with our irresistible Bed and Breakfast Blueberry Pancakes(page 5). 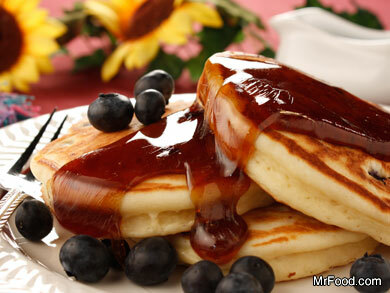 Top them off with fresh fruit, butter, and syrup for the ultimate breakfast meal. If you're looking for a way to get your kids to finish what's on their plate, then our Morning Pizza (page 7) is a fantastic option. Filled with all of the good brunch foods you want them to eat, this is one easy brunch recipe that'll make all of you happy! For a breakfast menu item with a little bit of extra zest, our Zippy Artichoke Oven Omelet (page 10) is the ideal solution. You'll never look at a boring bowl of cereal the same way again! The weekend is your time to wind down and get rid of all of the stress you've gathered over the week. Between work, family obligations, household duties, and so much more, it's asking a lot to be a full-time chef as well. We hear you — and we want to help! We love a good, old-fashioned home-cooked meal as much as the next person, but none of us have the time to spend hours in the kitchen, preparing different brunch menu items the night before and waking up in the wee hours of the morning to get it all done. The weekend is your time to sleep in and take care of yourself. That's why all of our recipes follow the Mr. Food Test Kitchen philosophy of "Quick & Easy" cooking so that you can spend your morning taking it easy instead of juggling more pots and pans than you can handle. Whether you're cooking breakfast for a crowd or you're rewarding yourself from a long and stressful week, this eCookbook is your ticket to an "Easy-Breezy Brunch" you won't soon forget. Our free eCookbook was made with you in mind. Our Test Kitchen triple-tests each of these easy brunch recipes to make sure you won't have any problems when you're on your own in the kitchen. Plus, all of our ingredients are easy to find so you're not running around to obscure grocery stores trying to find everything you need. In fact, you probably already have most of these ingredients lying around your kitchen! 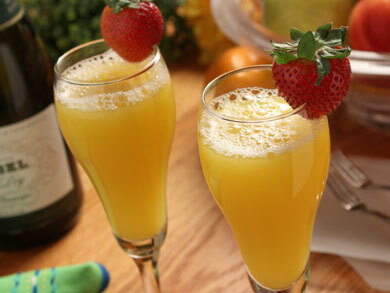 What's a good breakfast or brunch without a refreshing beverage to wash it all down? The drink is like a second experience in and of itself! Kick off your Sunday brunch buffet with a burst of energy with our Peach Yogurt Refresher (page 18). This breakfast drink is so much better than anything you'd find at the grocery store because it's not bogged down with those unnatural, artificial preservatives. Continue your healthy breakfast cleanse with a Frozen Banana Latte (page 17) that you're going to have to see to believe. Who says you can't enjoy coffee alongside your fruit? If you're looking for a drink that's really going to brighten up your day, you can't go wrong with one of our Sunny Mimosas (page 19). A cheery addition to any meal, this drink recipe is a great way to bring the perks of a vacation back to you! We suggest serving these brunch morning drinks with a side of your favorite fruit for the ultimate way to wake up. Wait, what's dessert doing in a brunch cookbook? Here at the Mr. Food Test Kitchen, we believe that every meal deserves a little reward now and again. And what better way to indulge in a weekend feast than with dessert for breakfast! For a fun twist on your typical breakfast cake, try our recipe for Orange Almond Coffee Cake(page 22). Drizzle it with some of your favorite icing, and you'll be able to hear the “OOH IT'S SO GOOD! 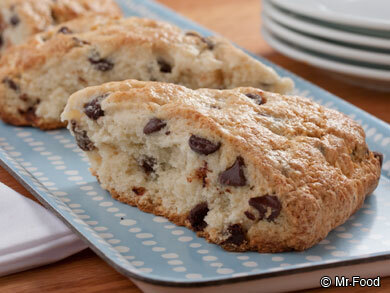 !®" For a breakfast on-the-go, our Chocolate Chip Scones(page 23) will certainly hit the spot! They're a wonderful way to bring brunch to wherever you happen to be. Don't worry, we didn't forget about all of those sweet-tooths out there! We've got something special just for you: Quick Doughnuts and Doughnut Holes(page 26). If you've wanted to learn the secret to making those delicious bakery classics, you've come to the right place. Your fantastic brunch menu is only truly complete when you've got a sweet treat to top it off! As a fan of the Mr. Food Test Kitchen's Quick & Easy cooking philosophy, I know you can see the value in this free ebook. Try out these easy brunch recipes with the free Easy-Breezy Brunch: 26 Easy Brunch Recipes for Any Occasion. Once you subscribe to receive our newsletter, you'll see how much fun it is to be a part of the Mr. Food community! If you've ever searched for quick and easy recipes, fast dinner ideas, slow cooker recipes or anything in-between, let MrFood.com deliver triple-tested recipes straight from our Mr. Food Test Kitchen that are both easy to make and delicious to eat. Check out this free eBook and the MrFood.com site to draw tons of inspiration for your next holiday or meal! Certainly looking forward to making all this..Always looking for new recipes to try!! This is great and helpful to me the recipe is easy to follow. Could use pitcures of each recipe but other than that it was easy and tastie. I too take goodies to a nursing home. They love them all. Thanks for the new recipes, as well as all the others I have been collecting. An excellent choice of cooking suggestions and learning technigues. Wow! !